If you've ever had an impactful, disruptive product or business idea, been curious about owning your own business, or have already taken the first steps on your entrepreneurial journey, this is the book for you. If you've been running your own company for the last seven-odd years, and scale, brand and value-creation are some of the crossroads for you now, keep reading. If you think your parents or family would freak out if you dared to suggest ditching your safe haven - your professional job - to pursue your dreams of owning your own business, relax. Better yet, share this book with them. If you're an experienced professional ready to take the plunge into starting your own business or committed to growing into an effective leader in the company you work for, read on. This book hopes to demystify failure, inspire success, raise ambitions and help you think big. Dream With Your Eyes Open shares failures and triumphs, thoughts and anecdotes in a simple narrative that could help you gain better insights into entrepreneurship and give you a fighting chance when it comes to realizing your dreams in a David-versus-Goliath world. Only then will we succeed in harnessing the country's enormous entrepreneurial potential with the most energetic and passionate people in the world, alive with fresh mindsets, optimism and hope. This book is about 'it can be done', not 'I did it'. It's all possible. Just dream your own dream - and when you do, dream with your eyes open. 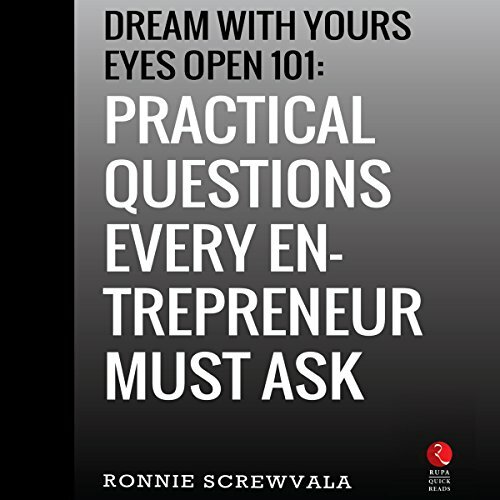 ©2015, 2016 Ronnie Screwvala (P)2018 Audible, Inc.
Cheaters : the title says 101 questions will be answered. But they answer only 17 questions.